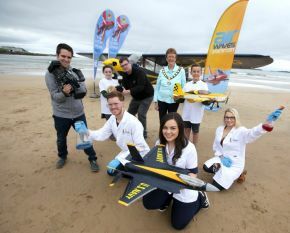 Ulster University is delighted to be amongst exhibitors as the STEM Village returns to AirWaves Portrush for the third year running. Organised by Causeway Coasts and Glens Council, Airwaves Portrush has developed into the foremost festival of its kind in Ireland and the third largest in the UK, attracting around 100,000 visitors each year to the north coast, and specifically, Portrush. Recognising the value of the show as an opportunity for industrial engagement and career inspiration, the STEM Village was introduced to develop the event’s capacity as an economic driver beyond its tourism potential. At the STEM Marquee, Ulster University will inform and inspire people of all ages, from lifestyle adjustments to improve health, to exploring the opportunity for study and research in a wide variety of health sciences and vocations. Ulster will be represented by staff and students from across Biomedical Sciences, Pharmacy, Health Sciences, Nursing, Psychology and Sport. Have you ever wondered how to put the 'fizz' in bathbombs? Would you like to extract DNA from strawberries using common household items? Are you interested in learning how to adopt a more balanced diet? Or are you curious to know more about your organs and the human body? Then, join us at the STEM Village to find out more! Further information is available at airwavesportrush.co.uk . You can also follow @STEM_Airwaves for regular updates.